If you thought you get to play GoldenMan himself you’d be wrong. 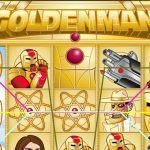 In this game you’re his assistant and you help GoldenMan to protect Earth from the evil…. GoldenFace…. But don’t let this doscourage you because GoldenMan is so rich and he will pay you very generously for all your help! The Rocket is the wild symbol in this game and it expands on reels 1, 2 and 3. The first scatter is GoldenMan Palm symbol. Landing 3 or more will give you 15 free spins with a 3x multiplier. The second scatter is the Flying GoldenMan. Landing 3 or more anywhere on the reels will trigger the bonus round. 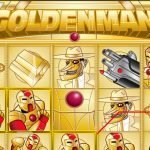 In this round you will face the evil GoldenFace where you will have 3 shots to destroy his approaching planes. Each time you make it you win a prize!. For a 2008 game I guess it is a good one. So if you’re feeling nostalgic a bit go ahead and play it. Otherwise it is quite simple and the graphics is far from being appealing. 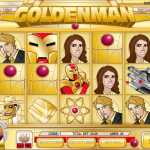 If you’re into super-heroes then try playing GoldenMan a 5 reel slot by Rival.